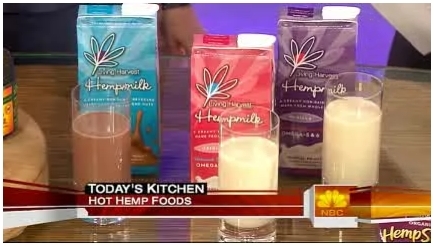 TODAY Show - Hemp: Hot new food trend? 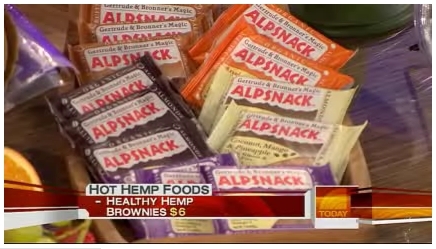 Food editor Phil Lempert talks with TODAY's Natalie Morales about a new food trend that's hitting store shelves: Hemp. 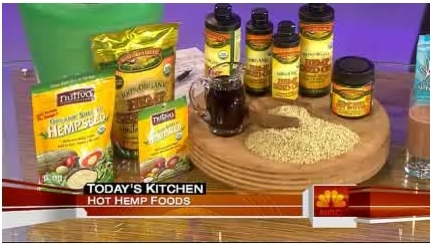 You can click here to see the video and read the companion piece Nutty hemp a hot food trend. Good stuff! 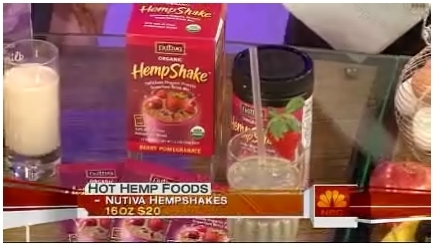 Please click on any one of the pictures to learn more about the products. BISMARCK, ND — North Dakota's Agriculture Commissioner Roger Johnson has accepted the first application from a farmer for a state Industrial Hemp license. The license, which is expected to be granted, will go to farmer and North Dakota Assistant House Majority Leader David Monson, ten years after the first hemp bill was passed in the state. Farmers will make history as North Dakota is the first state to grant commercial hemp farming licenses in the United States in fifty years. It is unclear what the Drug Enforcement Administration will do when they receive requests for the licenses to be effective. "I submitted my application for an industrial hemp license with the state Department of Agriculture earlier today," said Representative David Monson, R-Osnabrock. "I expect that the state will grant me a hemp farming license, but I'm not sure that the $3,440 non-refundable registration fee I will send to DEA with my application for manufacturing and importing will get me anything. Burton Johnson, an agronomist and professor at North Dakota State University (NDSU), has submitted at least 2 applications with DEA since 1999, but has never received a license in those seven years," says Monson. "I'm prepared to take this to court if DEA refuses to grant a permit in a reasonable amount of time or places onerous restrictions on it." Representative Monson operates his farm in Osnabrock, ND and is only 25 miles from the Canadian border and 110 miles from the nearest hemp seed processing facility, Hemp Oil Canada in Ste. Agathe, Manitoba. Urgent call for papers to be published in the journal. The North Dakota Department of Agriculture has put out a new press release Hemp Growers License Applications Available, which is also below, announcing the availability of their Application for Industrial Hemp License. The forms are available on the Industrial Hemp Farming page as well. BISMARCK - Applications for licenses to grow industrial hemp are now available from the North Dakota Department of Agriculture (NDDA). "Prospective growers can write or call the department or go online at www.agdepartment.com and click on 'Hot Topics' for an application form," Agriculture Commissioner Roger Johnson said Wednesday. "We urge all producers who intend to raise industrial hemp this year to begin the application process as soon as possible." The department address is 600 E. Boulevard Ave., Dept. 602, Bismarck, ND 58505-0020; the telephone number is (701) 328-2231, and the e-mail address is ndda@nd.gov. Johnson said North Dakota is the first state to license industrial hemp growers. "Our Legislature has passed numerous bills with strong, bipartisan support to make it possible for North Dakota farmers to grow this potentially valuable crop," Johnson said. "Our regulations, which become effective this month, require licensed industrial hemp farmers to submit to criminal background checks and fingerprinting. 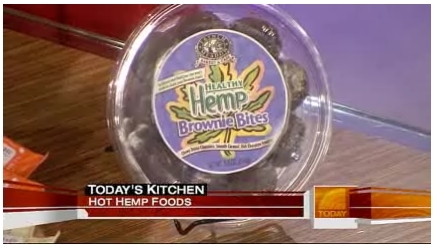 They must also provide satellite coordinates that identify the locations of industrial hemp fields. These regulations apply to everyone who owns, operates or works at a hemp farm or who grows, handles or processes industrial hemp." Johnson said that in addition to the application form, prospective growers must also obtain an official fingerprint card from NDDA. The card is not available online. "The fingerprinting must be administered by local law enforcement officials," Johnson said. "When the application forms and fingerprint cards are completed, they must be returned to NDDA with the required fees." The state charges two fees: $52 to cover the cost for fingerprinting and criminal background checks, and a $5-per-acre grower's fee (minimum $150). The fees are non-refundable. Once approved by North Dakota authorities, the licenses will be forwarded to the U.S. Drug Enforcement Agency (DEA) for final approval. "It is up to the DEA to register the license holder," Johnson said. "If registration is withheld or denied, the license holder cannot grow the crop. Johnson has asked the DEA to waive its registration fees for individual growers. "We still have not heard back from DEA," he said. "But in the meantime, a prospective grower must have a North Dakota license in hand before applying for DEA registration." MEDIA: For more information, please call Ted Quanrud at (701) 328-2233 or tquanrud@nd.gov or Patrice Lahlum at (701) 220-4357 or plahlum@nd.gov. Good, up to date statistics on hemp production are hard to come by. Health Canada's Statistics, Reports & Fact Sheets on Hemp page is OK, but a tad out of date. The hard part, especially for reporters, is to figure out the difference between licensed acres, seeded acres, and acres produced. Alexis Baden-Mayer, Vote Hemp's Director of Government Relations, found the page Industrial Hemp Production Rebounding at the Alberta Agriculture and Food Web site and emailed it to me. The document has a nice six paragraph overview of hemp in Canada as well as three really nice graphs of hemp productions statistics, by province, from 1998 to present in both hectares and acres. The latest Health Canada statistics, which I have not been able to find anywhere else, show that 24,021 acres of industrial hemp were produced in Canada in 2005 and 48,060 acres in 2006. Are we headed for 100,000 acres by 2008? Dan Gunderson of Minnesota Public Radio has a really nice report on recent happenings in North Dakota. The story "North Dakota challenges federal ban on hemp" has a lot of nice features including Real Player audio, Web links, and a short slide show. Here is a larger version of the Manitoba Agriculture, Food and Rural Initiative hemp image. I have one nit to pick, though. 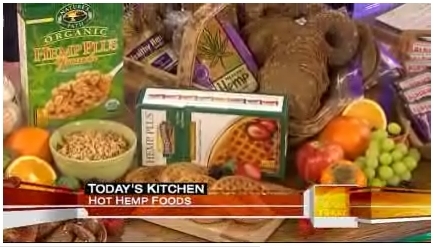 The story states that "Industrial hemp has been illegal in the United States for 50 years." which is not true. it is not illegal to grow hemp in the U.S. and it has only been in its current state since the adoption of the Controlled Substances Act (CSA) in 1970. Jean Rawson, of the Congressional Research Service, also noted this in her 2005 CRS Report "Hemp as an Agricultural Commodity" for the U.S. Congress: "Strictly speaking, the CSA does not make Cannabis illegal; rather, it places the strictest controls on its production, making it illegal to grow the crop without a DEA permit." Growing hemp is kind of like driving, you can't drive without a license and you can't grow hemp without a permit. The difference is that it is almost impossible to get a permit from DEA to grow hemp. What we have now is essentially an administrative ban. 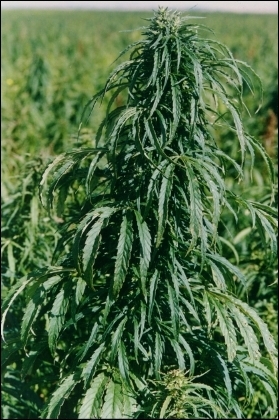 The last commercial hemp crop was grown by farmers in the Waupun/Brandon, Wisconsin area for the Rens Hemp Company in in 1957 and was processed by their mills in 1958. The last crop of hemp permitted to be grown in the U.S. was used to eradicate Canada Thistle from corn fields. Two LaCrosse County, Wisconsin farmers obtained Licenses for hemp cover crops for the spring 1958 planting. The exemption for hemp in 21 U.S.C. 802(16) was carried over from the Marihuana Tax Act, but the registration provisions of the Act were not. Up until the decision in LEARY v. UNITED STATES, and the subsequent passage of the CSA, a farmer could have applied for and received a Producer of Marihuana Special Tax Stamp for $1.00. Now one would need to go through a mind numbing DEA Drug Registration, a process not intended for farmers, with high fees. The North Dakota Department of Agriculture has asked DEA to waive registration for hemp growers as part of their Hemp Farming program. We will see if they get a response from DEA.